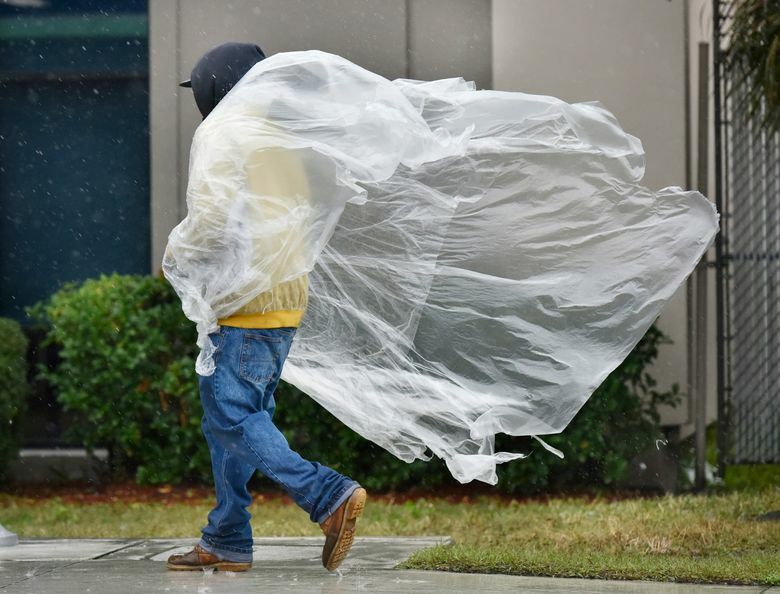 SAVANNAH, Ga. (AP) — A brutal winter storm smacked the coastal Southeast with a rare blast of snow and ice Wednesday, hitting parts of Florida, Georgia and South Carolina with their heaviest snowfall in nearly three decades. 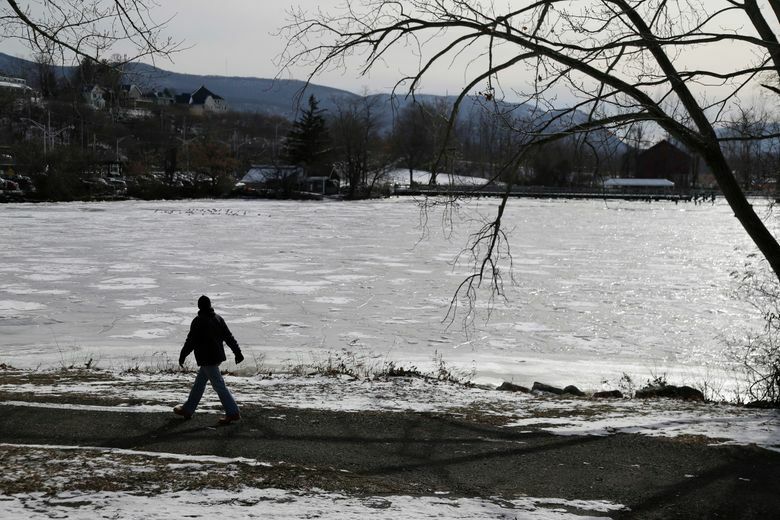 Forecasters warned that the same system could soon strengthen into a “bomb cyclone” as it rolls up the East Coast, bringing hurricane-force winds, coastal flooding and up to a foot of snow. 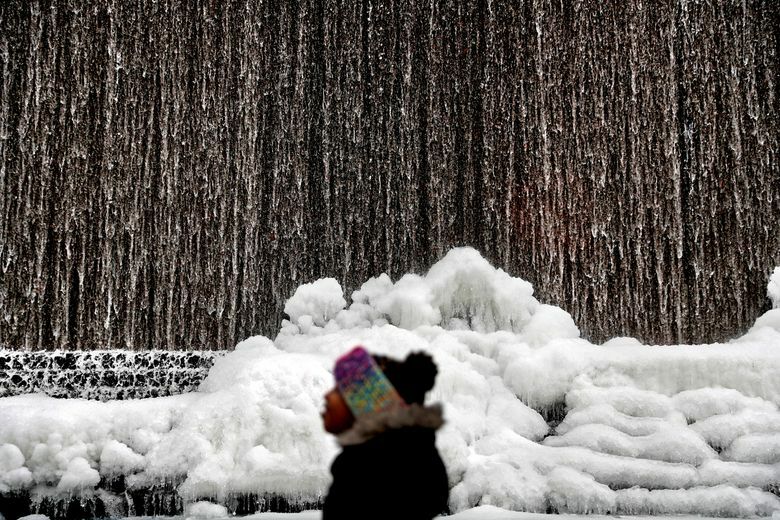 At least 17 deaths were blamed on dangerously cold temperatures that for days have gripped wide swaths of the U.S. from Texas to New England. A winter storm warning extended from the Gulf Coast of Florida’s “Big Bend” region all the way up the Atlantic coast. Forecasters said hurricane-force winds blowing offshore on Thursday could generate 24-foot (7-meter) seas. Schools in the Southeast called off classes just months after being shut down because of hurricane threats, and police urged drivers to stay off the roads in a region little accustomed to the kind of winter woes common to the Northeast. 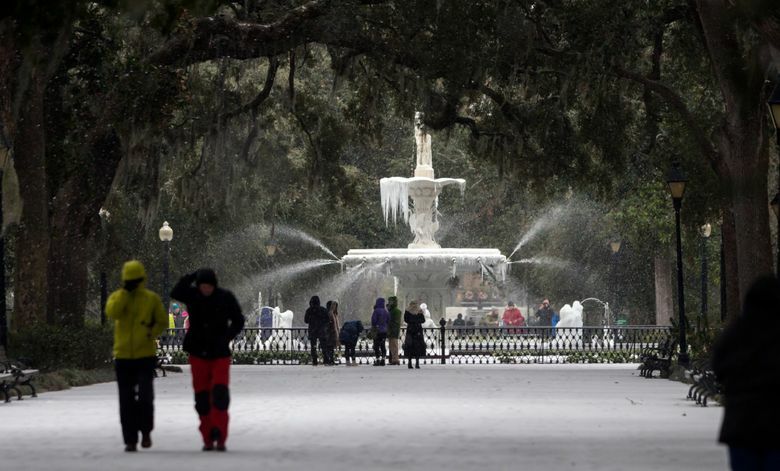 In Savannah, snow blanketed the city’s lush downtown squares and collected on branches of burly oaks for the first time in nearly eight years. William Shaw, a Savannah native, used baby steps to shuffle along a frozen road from his home to the post office. Dump trucks spread sand on major streets in Savannah ahead of the storm and police closed several bridges, overpasses and a major causeway because of ice. By the time the morning’s dreary sleet and rain turned to fluffy snow, Savannah came out to play. Families with children flocked to Forsyth Park near the downtown historic district for snowball fights. 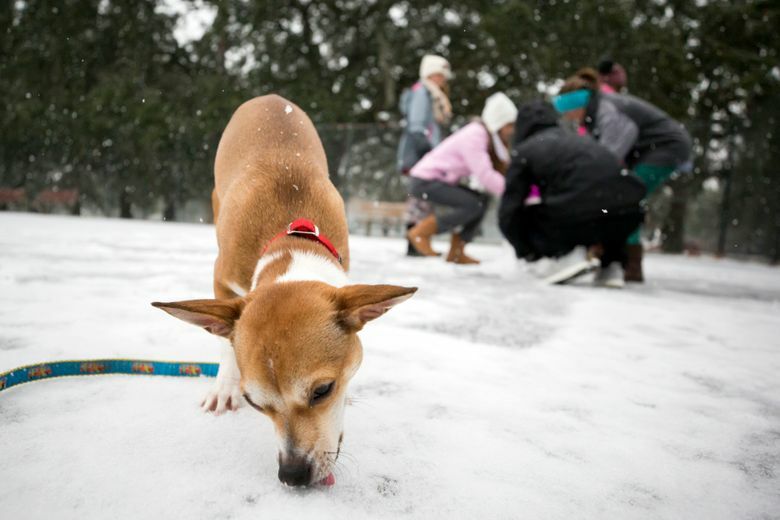 The National Weather Service recorded 1.2 inches (3 centimeters) of snow — Savannah’s first measurable snowfall since February 2010 and the first that exceeded an inch (2.5 centimeters) in 28 years. Across the Georgia-South Carolina line in Charleston, the weather service reported 5 inches (12.7 centimeters) as the snow was winding down at 5 p.m. That’s the most snowfall in Charleston since December 1989, and plenty for Chris Monoc’s sons, ages 4 and 2, to go sledding outside their home near the city’s iconic Ravenel Bridge. Airports shut down in Savannah, Charleston and elsewhere as airlines cancelled 500 flights Wednesday, and at least 1,700 more were cancelled Thursday. Interstate 95 was nearly an icy parking lot for almost all of its 200 miles (322 kilometers) in South Carolina. Troopers couldn’t keep up with the number of reported wrecks which numbered in the hundreds. In Tallahassee, Florida, Michigan transplant Laura Donaven built a snowman 6 inches (15 centimeters) tall. 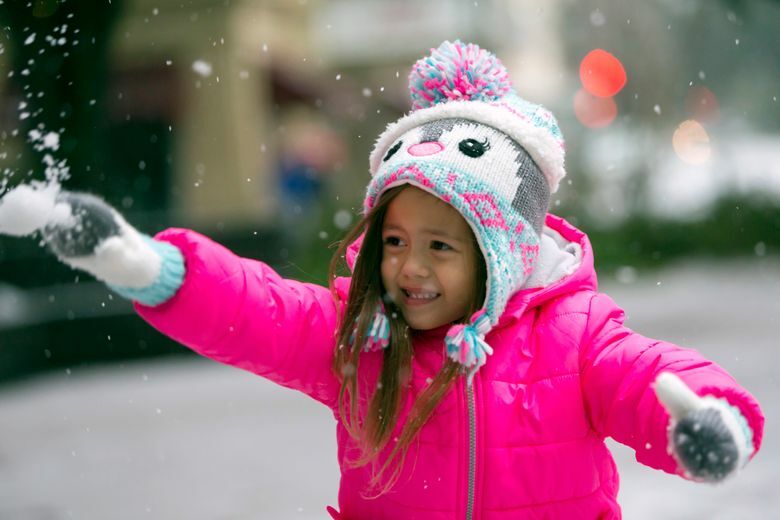 The city tweeted that snow fell there for the first time in 28 years. “I made a snowball and threw it at my dad,” said Donaven, a 41-year-old hair salon owner. 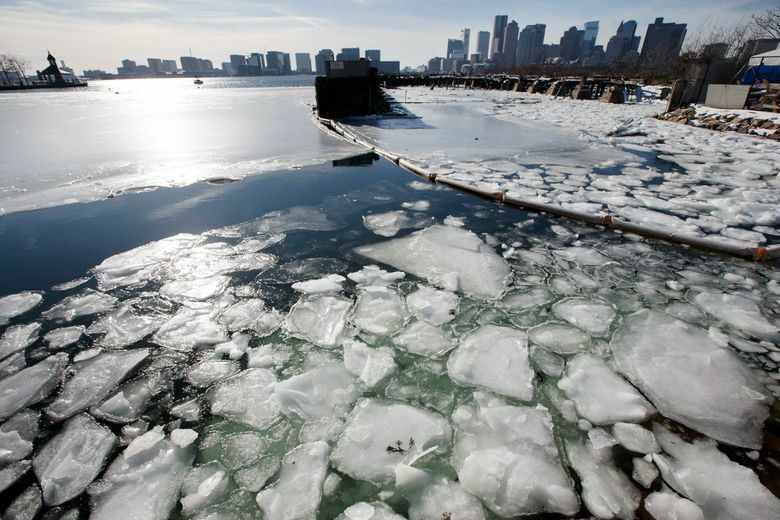 The weather service said the winter storm will probably intensify into a “bomb cyclone” that could dump more than 8 inches (20 centimeters) of snow on the Boston area on Thursday and at least half a foot (15 centimeters) of snow in the New York City region. Meteorologists have been using the term “bomb” for storms for decades, but the phrase went viral on social media on Wednesday. A storm is a bomb — or bombogensis happens — when it drops 24 millibars of pressure in 24 hours. This storm looks like it will intensify twice that rate, said Bob Oravec, lead forecaster at the National Weather Service’s Weather Prediction Center. 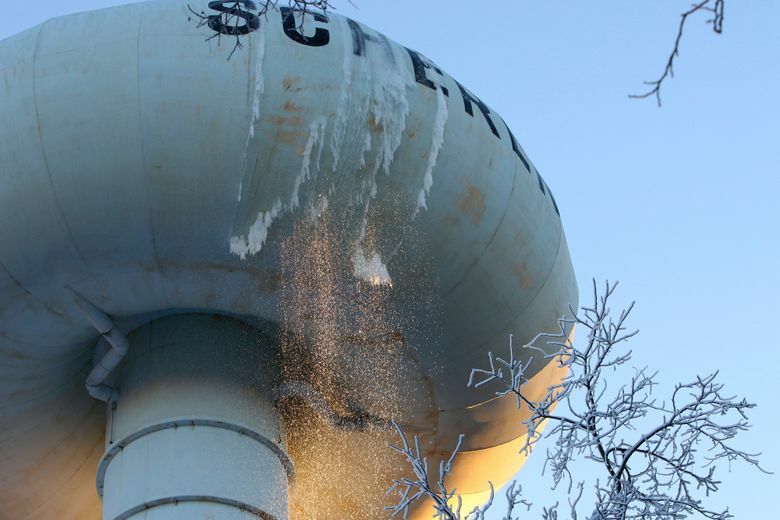 Mississippi’s largest city said record cold is breaking water mains, leaving some customers with little or no water flow. Jackson city spokeswoman Kai Williams said Wednesday evening that the city knew of 37 separate water main breaks that it attributed to cold. The city has declared an emergency and is hiring outside contractors to help repair water main breaks. Blizzard warnings were issued from Rhode Island to Maine. Oravec said he expects they could be extended as far south as parts of New York. “It’s sort of akin to a hurricane traveling up the coast,” says Ryan Maue, a meteorologist at the private firm Weather.US. Georgia Gov. Nathan Deal declared a state of emergency through Friday for 28 counties. School systems on the Alabama coast waived uniform requirements so students could bundle up. Florida’s largest theme parks announced that water attractions such as Disney’s Typhoon Lagoon, Universal Orlando’s Volcano Bay and SeaWorld’s Aquatica were closed. Temperatures were running well below normal for this time of year, and the lows are expected to hover right around freezing. In Prairieville, Louisiana, Valerie Anne Broussard struggled overnight to keep warm in a house that is being rebuilt after the 2016 floods that hit the small community southeast of Baton Rouge. Her home has exterior walls and floors but no insulation, no central heating and only a few working electrical outlets. Eggs that she left on the kitchen counter froze and broke open. 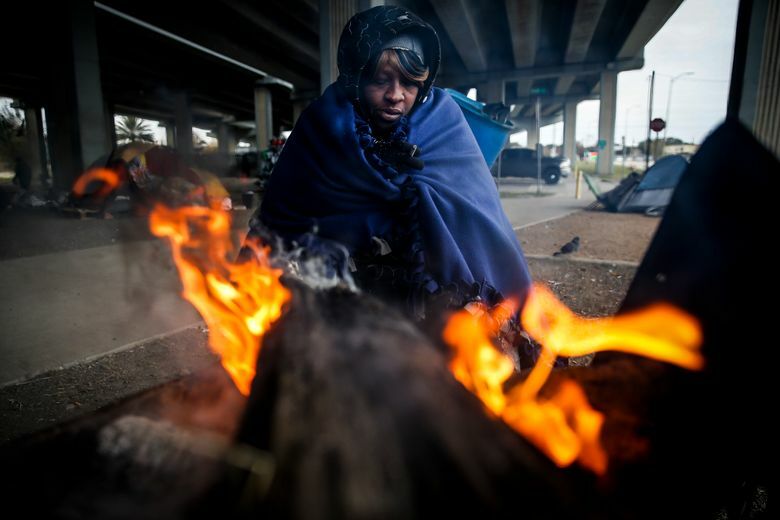 “It’s like a camping trip that I didn’t sign up for,” said Broussard, who’s been huddling with her 8-year-old daughter, newborn baby and boyfriend in a bedroom warmed by space heaters. Making the most of the South’s bitter cold snap, the North Carolina Zoo in Asheboro offered discounted tickets for those willing to brave the cold to see polar bears frolic in their kind of weather, along with Arctic foxes and elk. African elephants, lions and gorillas were sheltered out of public view. 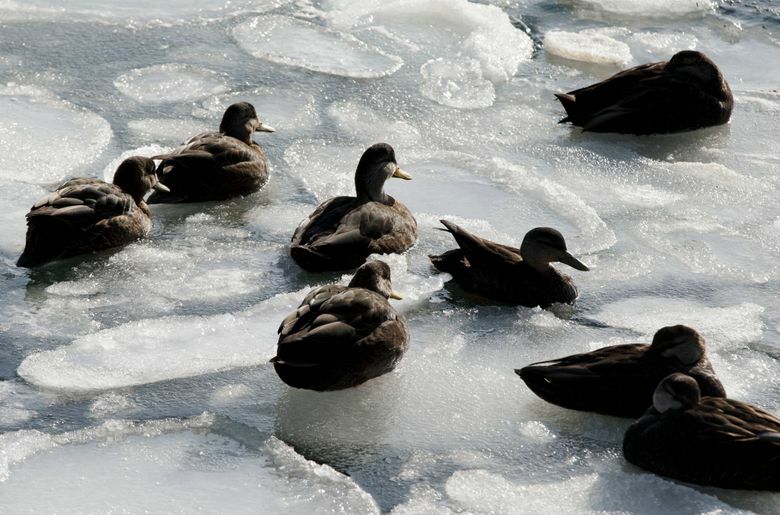 As the cold pushed farther northward, Jerry Gorans found himself stunned by the frigid temperatures as he walked along the waterfront City Dock of Annapolis, Maryland, where birds stood still on icy water. Associated Press reporters Seth Borenstein in Washington; Jay Reeves in Birmingham, Alabama; Tammy Webber in Indianapolis; Jeff Martin in Atlanta; Freida Frisaro in Miami; Brendan Farrington and Gary Fineout in Tallahassee, Florida; Jonathan Drew in Raleigh, North Carolina; Jeffrey Collins in Columbia, South Carolina; Rebecca Santana in New Orleans; Brian Witte in Annapolis, Maryland; Jeff Amy in Jackson, Mississippi and Stephen Morton in Savannah contributed to this story.